Speaking of Marvels is a blog that features interviews with authors of chapbooks, novellas, and books of assorted lengths. Past interviewees have included Cecilia Woloch, Fatimah Asghar, Bethany Carlson, Jessica Piazza, Molly Gaudry, Jane Wong, Dariel Suarez, Rebecca Hazelton, Elizabeth Savage, Philip Metres, Karin Gottshall, Soma Mei Sheng Frazier, Bianca Spriggs, Karen J. Weyant, Anne Valente, and Ailish Hopper. William Woolfitt is the author of the poetry collections Beauty Strip (Texas Review Press, 2014) and Charles of the Desert (Paraclete Press, 2016). His fiction chapbook The Boy with Fire in His Mouth (2014) won the Epiphany Editions contest. His poems and stories have appeared in Blackbird, Image, Tin House, The Threepenny Review, Michigan Quarterly Review, Epoch, and other journals. He is the recipient of the Howard Nemerov Scholarship from the Sewanee Writers’ Conference and the Denny C. Plattner Award from Appalachian Heritage. Is there anything more holy than to salvage something others have perceived as trash, to resurrect it, to make new life from what was deemed artless and unworthy? William Woolfitt performs miracle after miracle by writing poems about the discarded, the abused and ignored, the threatened ways of life that are slipping into the past in his beloved Appalachia. Beautiful in their craft and in their longing, Woolfitt is exactly the right poet to transform “a dark puzzle of cumulus clouds” into the heavy-cadenced music of his verse. As he confesses, his “tongue has power enough to reform/ or demolish.” I’m thankful he’s bent on reforming the earth, praising its many living things by chanting their names with loving-kindness. 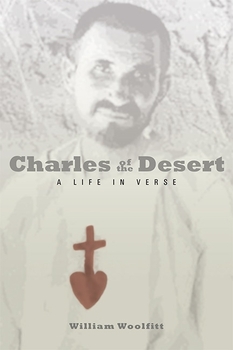 “Woolfitt’s Charles of the Desert is the ‘ragged song’ of Charles de Foucault, attuned to the ‘sweat beneath scratchy coverlets,’ ‘the hoe and the rake,’ and to how a life can be ‘all green wood’ that, in the work of years, leaps with the strange wildness of faith. In the midst of overwhelming natural beauty, rendered with such sensuous language that the reader of William Kelley Woolfitt’s first full-length collection well-nigh swoons in delight, hides desecration, the earth left raw and bleeding behind the “beauty strip” the coal companies create to block from view their destruction. Therein lies the metaphorical paradox of this stirring, profoundly moving book of poems, the destruction that lies behind the disguise meant to allow us to keep living our lives in a state of unknowing. Around that troubling central image, however, pulses the natural world, “center and zenith” as Woolfitt describes it in “Ring of Earth,” echoing James Still’s abiding River of Earth. Through the beauty of his poetry, Woolfitt restores the world so carelessly and greedily desecrated. Stephen Spender once described poetry as “enchanted utterance.” Here is that utterance. Listen, and listen again, to its songs and its warnings.